The state BJP today sought an assistance of Rs 21,000 crore from the Union government as compensation for the preliminary assessed damages to the state in the recent excessive rains. 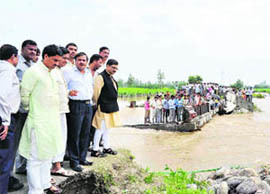 Tarun Vijay, Rajya Sabha MP, inspects flood-affected areas on Tuesday. Excessive discharge of water from the Tehri reservoir resulted in flooding of the 400 MW Koteshwar Dam construction site which is the second phase of the Tehri hydro project. BJP leader Mohan Singh Rawat Gaonwasi has admitted that disaster management preparedness was a complete failure in the state. In the wake of the worsening flood situation in several parts of Uttarakhand, a delegation led by RK Dhawan, general secretary of the state Congress, Bhola Pandey, co-in charge, and Vijay Bahuguna, Member of Parliament, Tehri Garhwal, met Dr Manmohan Singh, Prime Minister, to request him to release relief funds for the disaster-prone areas in the state. Leader of the Opposition Harak Singh Rawat, along with Congress workers, today visited the areas that were most affected by the incessant rains in the district. The places where people were affected by rains and floods include Majra, Aazad Nagar Colony, Ahid Colony and Morowala. Indo-Tibetan Border Police (ITBP) officials want all 37 members of 16th and last returning batch of the Kailash Mansarovar Yatra to be airlifted by helicopters from the Gunji camp. The Uttarakhand Kranti Dal (UKD) has postponed its plan to protest before the Vidhan Sabha scheduled for September 22 in view of large-scale destruction triggered by the four-day downpour in the state. Members of the Punjabi Sangathan, Uttarakhand, paid homage to the deceased of the devastating floods in the state. The activism of actor and Padam Shri Tom Alter on September 16 when he sat on a silent dharna in support of the demolished building of the Clock Tower, also considered as a heritage site, paid off here today. The Nagar Palika Executive Officer inaugurates work at the Clock Tower in Mussoorie on Tuesday. 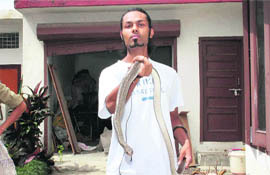 Two rat snakes were rescued from different residential areas of Dehradun today. The first rat snake was rescued from the posh locality of Vasant Vihar. Activists of EFFECT, a wildlife-linked NGO, who were informed of the happening by the state forest authorities, reached Vasant Vihar and after a search, managed to capture the rat snake that was around 6 feet long. The fight over taking credit for the construction of a night shelter home (rain basera) between the state government and the Mayor on the day of its inauguration is an old story now, but what is new is that the Dehradun Municipal Corporation (DMC), which got it built, did not even think it necessary to take a proper sewerage connection and make sewerage chambers for this place, which was built for the poor and homeless to stay at night. The Health Department today transferred 13 doctors, who were earlier on posts of Additional Director and Joint Directors. Dr Anil Shah, Chief Medical Officer, Champawat, and Dr BL Verma, CMO, Almora, have been promoted as Additional Directors and transferred to the Director-General, Health and Family Welfare office. The Mussoorie Nagar Palika has backtracked on the issue of organising the Autumn Festival here from October 15 due to relentless opposition from various quarters. The ongoing agitation of employees of the CLEAN project got a boost as more and more people have extended support to their demands. The organisation like Doon School Panchayat branch of Mussoorie, Hotel Restaurant Karamchari Sanghatan and various social activists have supported their demands. In view of the police duty for the Vidhan Sabha session that will commence from tomorrow, Senior Superintendent of Police (SSP) Ganesh Singh Martolia took a briefing of cops at the Police Lines here today. Addressing mediapersons at the state party office, national spokesman for the party Tarun Vijay said the preliminary assessment of the damages due to the rains had been to the tune of Rs 21,000 crore and sought the same as compensation from the Centre. At the conference, he also put forward an assessment of damages on roads, houses, potable water pipelines, agriculture land and power, apart from losses of life. He said in Uttarakhand a total of 170 persons had lost their lives because of rain this year and a total of 50,000 houses had been damaged in the process. The BJP also questioned the logic behind UPA Chairperson Sonia Gandhi’s aerial survey of rain-ravaged areas of Uttarakhand. Vijay said aerial survey was not to the consent of sufferings of the people. “Sonia should have at least met people in the affected areas or at least gone for some communication,” said Vijay. He referred to the previous meeting of the BJP delegation led by LK Advani with the Prime Minister. Vijay, who was part of the delegation, said the Prime Minister took a serious note of calamity in the state. Vijay, a Rajya Sabha MP, demanded all-weather roads in the border areas and the Char Dham routes. He reminded that all connectivity had been lost in the state with a total of 1,500 roads getting damaged due to the rain, which in totality comprised 20,000 km length of roads. The BJP leader also questioned the veracity of big dams. “Big dams are not good for us in the long run,” he added. Vijay denied any change of leadership in the state in near future. “The BJP will contest next assembly elections in the state under leadership of Dr Ramesh Pokhriyal Nishank,” he said. “The water flow from the Tehri reservoir increased last night, inundating parts of the Koteshwar Dam, including its power house,” said THDC Chief General Manager AL Shah. The authorities said the discharge from the Tehri reservoir was increased after its level hovered at 831.45m, more than 1m above the maximum of 830m. “The discharge has been increased from 1,250 cumex which would help reduce the level,” said Tehri DM Radhika Jha. CM Ramesh Pokhariyal Nishank, who yesterday visited the district, said a total of 412 families in 25 villages had been affected in Tehri and Uttarkashi districts by the rising reservoir waters of the Tehri dam. He said the total losses due to heavy discharge of water would only be made after the water level receded in the coming few days. Addressing mediapersons here today, Gaonwasi said both the Centre and the state government had been the least sensitive towards frequent disasters being faced by Uttarakhand. He said excessive rain had exposed the state’s disaster preparedness, as the requirement for disaster equipment had been greatly felt this time. Gaonwasi stressed for the formulation of the disaster management policy at tehsil and block levels. He said apart from disaster management officials, training should also be imparted to those engaged in teaching and other works. He appealed to the Central government to declare Uttarakhand a disaster-hit state. The former minister called for a separate policy for the Himalayan states. The BJP leader reiterated his opposition to the hydro projects in Uttarakhand and sought a complete ban on big projects in the state. “Only small power projects should be backed in the ecological sensitive areas like Uttarakhand,” he said, calling for collective efforts on the part of political parties and others to deal with the natural disasters. The delegation has given a memorandum to the Prime Minister mentioning that the floods, landslides, cloudbursts and rains have devastated the entire state and appealed to him to provide necessary financial relief packages at the earliest. The memorandum also says that the relief should be monitored by the Centre. The repair work on the national highways and borders should be carried out immediately, giving the rehabilitation of the villages affected by the natural disaster top priority. The delegation has also appealed to the Minister of Power to convene a meeting of the Tehri Hydro Development Corporation (THDC) and the state government to settle the outstanding problems of the affected families and regions, including the construction of the bridges, while deferring the recoveries of loans from banks and other financial institutions. While on the other hand, Harish Birmani, president of the Mahanagar Congress Committee, too, made an appeal to party workers to assist flood-affected people. Birmani also thanked Sonia Gandhi for paying a visit to Uttarakhand and assuring of providing relief for the inflicted state by the Centre. Also, to help flood-affected locals at Daudwala, Nai Basti and Mothrawala in Dehradun, the former Mayor and general secretary, All-India Mahila Congress, initiated a drive to clear up the debris here today. She, along with the residents of the areas, cleaned up water clogs and remains of the floodwater. He claimed that people told him that the administration did not care about them. They were most affected during the rainy season as 4 to 5 feet of water stood here every year and all their material goods comprising foodgrains, books, etc. got spoiled. The officials just took their names and addresses and never returned with the financial help provided by the government. Remembering about the tragedy that took place last year, the residents said they were still to receive the aid provided last year. They said people residing in these areas had to face trouble every year and the government took no steps to sort out the problem. Rawat told the people that he, with the help of the area MLA, would take the matter in the Vidhan Sabha and try to get them relief as soon as possible. He also talked to some of the officials and asked them to take steps immediately to help the locals. This has been suggested keeping in mind the badly damaged track route between Gunji and Bundi camps. The pilgrims today spent an extra day waiting at Gunji for the clearance of the route. “The route between Gunji and Bundi is damaged at more than six places. It is not likely to be repaired before three or four days, provided no more rain falls,” said Jodharwar Singh, Assistant Commandant, 7th BN, ITBP, who is with the pilgrims at Gunji. On the ITBP’s request, the Kumaon Mandal Vikas Nigam (KMVN) and Pitthoragarh district administration have requested the Ministry of External Affairs to send a helicopter to the Gunji camp and evacuate the stranded pilgrims. “I have requested the Joint Secretary (China) at the ministry to take an immediate decision about providing a helicopter to the pilgrims keeping in mind the adverse weather conditions,” said PS Gusain, Managing Director, KMVN. According to Pitthoragarh district administration sources, an assistant engineer of the PWD, along with his team, reached the spot and started constructing a temporary bridge at the Nazang nullah and some other points. “The PWD engineer says it will take at least two days to erect temporary bridges if no fresh rain disturbs the work,” said NS Negi, District Magistrate, Pitthoragarh. He added that he had also requested the Centre to send a helicopter to evacuate the pilgrims. “Even the airlifting will depend on the weather at Gunji which, at present, is covered by clouds,” said DM. 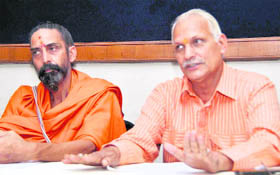 The Uttarakhand Kranti Dal (UKD) has postponed its plan to protest before the Vidhan Sabha scheduled for September 22 in view of large-scale destruction triggered by the four-day downpour in the state. The UKD had initially decided to lay siege to the Vidhan Sabha on the issues of closing hydro-power projects, shifting capital to Gairsain, controlling the increasing prices of commodities and formulating a transparent policy for youth employment. UKD President Trivender Singh Panwar said, “The whole hill state is troubled by landslides, floods, broken houses and buildings, obstructed roads and disrupted water and electricity supply, due to record breaking rainfall. Keeping such a grim situation unfolding all around, we have postponed our September 22 protest before the Vidhan Sabha to engage our party men in relief work. We have also requested the state government to direct its officials and ministers to provide urgent help in all affected areas and urge the Centre to declare Uttarakhand a disaster-hit region”. Panwar said the relief fund given by the state government was not sufficient, therefore, it should be increased to Rs 5 lakh to the next of the deceased and Rs 10 lakh for damaged houses. He also demanded an immediate relief fund of Rs 5,000 crore from the Centre. The sangathan also observed a 2-minute silence for the departed souls while criticising the state government for allegedly being insensitive at the crucial time of disaster all over the state. They also said it was shameful for the state BJP government to be appointing Cabinet ministers and organising a dinner party at a time when the entire state was trapped by the natural disaster. The sangathan has also appealed to the state government to immediately release relief funds. The Nagar Palika finally began the work of construction of the new tower according to Hindu traditions. Palika President OP Uniyal, along with other ward members, arrived in the morning and attended the puja ceremony with enthusiasm. The president, via a symbolic gesture, dug in one axe to formally announce the construction work of the tower. Uniyal, later speaking to the media, said the controversy created by Tom was unnecessary and at the behest of his opposing party. He also stated that if Tom was so keen on saving the heritage, he should have done a similar protest for the Gandhi Dwar at the library. Uniyal sarcastically said Tom had made no contribution to the town and sat in protest just for the sake of it and to enjoy a little bit of sunshine that was out that day. Uniyal said the Clock Tower, when completed, would contain a library where books of authors like Ruskin Bond would be kept. He also said one storey would have a small museum and the topmost floor would be for getting a high view of the town. Uniyal said the Palika was spending Rs 19 lakh on the structure and Narang would spend another Rs 21 lakh on its beautification similar to that of the Big Ben of London. The tower would be completed within six months. However, the chances of the tower being completed on time seemed far fetched as no permission had been sought or the site plan submitted to the MDDA by the Palika as yet. The Clock Tower demolition and then its construction had come under flak from various quarters and certain section views it as unnecessary wastage of the time and money of tax payers. The EFFECT team also visited another house at Shanti Vihar, Kaulagarh, and captured another rat snake. Here, the rat snake was around 8 feet long. Abhishek, who led the EFFECT team to capture the snake, said the snakes were non-venomous and were left in the forest later. Only a few days back a 12-ft-long python that had come out in open in the Jakhan region of Dehradun was rescued by the EFFECT volunteers. The fight over taking credit for the construction of a night shelter home (rain basera) between the state government and the Mayor on the day of its inauguration is an old story now, but what is new is that the Dehradun Municipal Corporation (DMC), which got it built, did not even think it necessary to take a proper sewerage connection and make sewerage chambers for this place, which was built for the poor and homeless to stay at night. Due to this blunder on the DMC’s part, users of this shelter home are unable to use toilets at the home. They now have to search for public toilets in the surroundings as the toilets of this shelter home will be closed for the setting up of the sewerage connection as well as chambers. The worst sufferers are Chakhu Mohalla residents whose life has become a hell for the past one month as the entire sewage from the shelter gets collected on the street of the locality due to a blockage in the temporary sewerage. Instead of working on the fault, the departments concerned are busy passing the buck. Assistant Mukhya Nagar Adhikari (AMNA) gave an assurance that the matter would be of resolved soon. Residents said as the shelter did not have a legal sewerage system and sewerage chambers, it was dumping the waste through drain pipes, which were open at the other end of the road. The blockage in the pipes was making the filth ooze out on the roadside. Hassled on not finding the Mayor in the DMC on Friday, the residents feared the situation worsening in their area. “It has become difficult to walk or drive on the street. Children can no longer play there. 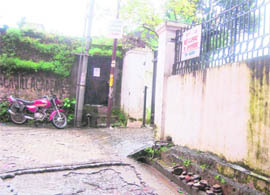 Rain has made matters worse as the filth keeps circulating with the rain water,” said Neeru Vora, a resident. She also claimed that the place, which was built for poor persons, was being inhabited by drunkards and anti-social elements. The stench and sight have both become unbearable. Mona Verma, another resident, said, “We are sitting on the brink of a breakout of infections. We fear dengue the most”. Shail Tandon, area councillor, said nearby residents had even asked the management of the shelter to close it till the problem was sorted out, but the management refrained from doing so as poor people would stop coming to the place. She said the management should at least lock the toilets and dwellers could meanwhile use public toilets. AMNA Rawat visited the area and gave directions to lock the toilets, but these were not followed and the problem continues to persist. The shelter is not the only the troublemaker in the locality. A small hotel ‘Krishna Lodge’ is also dumping its sewage through the pipes which pass through the houses. Avtar Singh, a resident, said, “As the drain is covered, the hotel owner has cleverly linked his sewerage to our drain and dumps the entire waste of the hotel. As per rules, he should have his own sewage connection and chamber”. The DMC has passed the buck to the Jal Sansthan and the sansthan to the MDDA, but thanks to Additional District Magistrate Vinod Suman, it has stopped there. Rawat said it was not the work of the DMC, but of the Jal Sansthan to install sewerage. VK Sethi, Executive Engineer of Jal Sansthan, said, “As per logic, we are not supposed to deal with this matter as the shelter does not have a legal sewerage connection, but now, we have agreed to do it as the place had been built for the welfare of poor people. We sought finance from the Mussoorie Dehradun Development Authority to lay proper sewerage which they refused to give”. Sethi confirmed that the MDDA had agreed to play its part after the intervention from the ADM and said very soon they would start working on the project. Dr Ajit Gairola, Senior Medical Officer (SMO), Doon Hospital, Dr Archana Srivastav, SMO, District Women’s Hospital, Dr RP Badoni, Chief Medical Superintendent, Dr SK Nautiyal, Sr Pathologist (Doon Hospital), Dr Anjali Nautiyal, SMO, District Women’s Hospital, Dr Ram Singh, CMO, Uttarkashi, Dr Meenu Rawat, officiating CMO, Dehradun, Dr JP Devshali, SMO, Doon Hospital, Dr Anil Arya, SMO, Doon Hospital, Dr Lata Bisht, CMS, Haridwar, and Dr Kiran Bisht, Dy CMO, Tehri, have all been promoted as Jt Directors and will be at Health and Family Welfare DG, Dehradun. Palika President OP Uniyal informed the media that he, along with ward members, had decided that as the state was in the grip of natural disaster in which several innocent lives had been lost, including those of children, hence, it was better to cancel the Autumn Festival celebration for the time being. He said the festival would be organised when the state recovered from the deep shock it was under going right now. The organisation opposing the Autumn Festival in the first place was viewing this as their victory. BJP leaders of the town were also against its organisation and BJP town secretary Kushaal Singh Rana had also written a letter to the Chief Minister to stop such a festival in this hour of grief. Autumn festivals are held on an annual basis in Mussoorie, but have been under a cloud of controversy since last year due to the allegations of corruption and irregularities. The 15 employees of CLEAN alleged that they were kicked out of their jobs on September 15 in an unjustified manner and have raised their demand to be reinstated. Rajya Andolan Kari Parishad president Jugran also visited the sit-in site amid the slogan-shouting against Sanjay Narang, who they considered the main conspirator behind their eviction. Jugran heard the problems of the employees and extended his full support. The agitating employees tearfully narrated the complete tale of their woes and vented their ire against Narang. The employees also alleged, in front of Jugran, that Narang had claimed with impudence that since he had given Rs 25 crore as donation to the state government, no one could touch him. Jugran said he was there to listen and address the grievances of the employees. He found that the employees had a strong case as the evicted employees had been working for the past seven years and should be provided immediate relief. He also said any businessmen from outside was welcome in the state, but he should not take the law for granted and should work according to local sentiments too. He also conversed with the Mussoorie SDM and directed him to solve the matter amicably, otherwise it could lead to a big law and order problem. Jugran requested the management to solve their problems immediately otherwise a massive movement would be carried out. Police personnel, who will be on duty at the Vidhan Sabha, were directed to wear a neat dress and work with humbleness. The security plan was also discussed during the briefing. All Additional Superintendent of Police (ASPs), Circle Officers (CO) and Station House Officers (SHOs) attended the meeting, said a police press statement. Important traffic diversions have been planned for the session and were also discussed at the briefing. After the meeting, police personnel did practice.